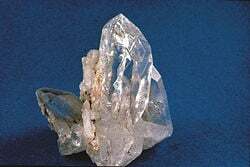 A quartz crystal is an example of a crystalline solid. A solid is one of the four principal states of matter. A solid object is characterized by resistance to deformation and change of volume. The branch of physics that deals with solids is called solid-state physics, and it is a type of condensed matter physics. Materials science is primarily concerned with properties of solids such as strength and phase transformations. It overlaps strongly with solid-state physics. Solid-state chemistry overlaps both these fields, but it is especially concerned with the synthesis of novel materials. The atoms or molecules that comprise the solid are packed closely together. These constituent elements have fixed positions in space relative to each other. This accounts for the solid's rigidity. If there is long-range order or repeating pattern in the positions of the atoms or molecules of a solid, it is called a crystalline solid. A crystal structure is composed of a unit cell, (a set of atoms arranged in a particular way), which is periodically repeated in three dimensions on a lattice. A crystal's structure and symmetry play a role in determining many of its properties, such as cleavage, electronic band structure, and optical properties. If sufficient force is applied, the ordered structure can be distorted, causing permanent deformation. If there is no long-range order or repeating pattern in the positions of the atoms or molecules of a solid, it is called an amorphous solid. Examples of amorphous solids include window glass, many polymers (such as polystyrene), and foods such as cotton candy. Because any solid has some thermal energy, its atoms vibrate. However, this movement is very small, and cannot be observed or felt under ordinary conditions. Most solids, when heated, are converted to the liquid form at their respective melting points. Some solids, however, are converted directly to the gaseous form—a property known as sublimation. The lightest known solid is man-made and is called aerogel. The lightest aerogel produced has a density of 1.9 mg/cm3 or 1.9 kg/m3 (1/530 as dense as water). Quantities of solids are commonly measured in units of mass and volume. Units of mass include grams, kilograms (an SI unit), and pounds; units of volume include the cubic meter (m³) (an SI unit). This page was last modified on 2 April 2008, at 16:42.